The spice jar STEHAUF is a small flacon for tea or kitchen herbs. 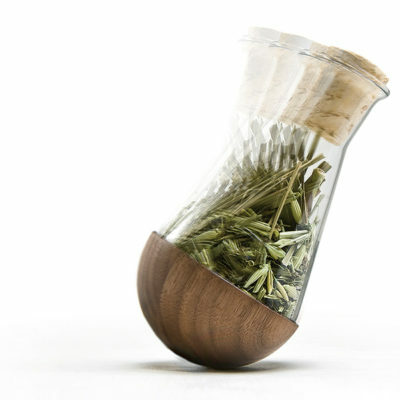 The complex crafted herb jars consist of a wooden base, a glass flacon, a weight and a cork as closure cap. As if by magic, the flacons simply do not fall over. They stand upright and are able to move when needed. The spice jar fits comfortably in your hand. The small opening enables to use the herbs precisely as needed. The STEHAUF HERB FLACONS are available in oak, ash or walnut. Click here for SHOP >>>. A noble herb jar is a special present and a must have in every kitchen. Herbs and teas are stored aroma proof in the STANDUP HERB FLACONS. The multi-oiled hartwood from walnut, ask or oak feels good in your hand and has a stand-up function. 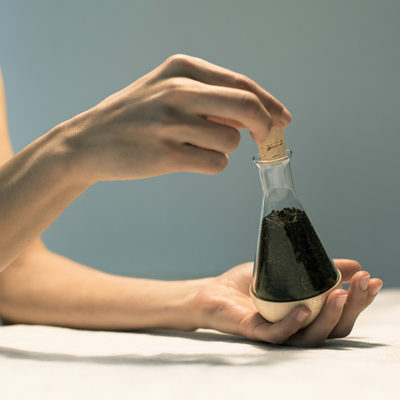 The herb jars hold about 100 ml and are closed with a natural cork. 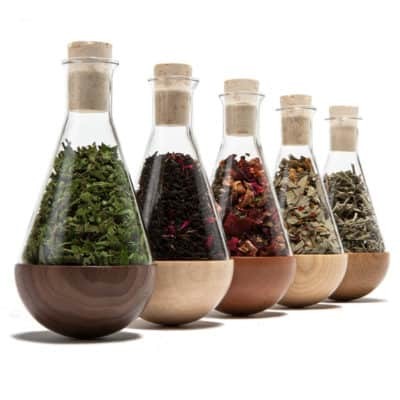 The narrow glass opening with a small curved rim ensures that spices and herbs can be dosed precisely. The pretty spice jar is a fine present for all hobby cooks, tea and herb lovers. And this is how it is done: The wooden half sphere is milled from mirror-glued hardwood, computer controlled. The next steps are done by hand. The wooden elements are treated several times with hard wax oil. The sanding results in a silky shine and a super smooth surface. The assembly of all components requires a lot of sensitivity. The adhesion of wood and glass is almost invisible. In the end, every product must pass our quality control. Cheaper B-quality versions are available here >>.